This photograph is of my grandfather, Lyle Lawrence Carringer (1891-1976), taken in about 1918. 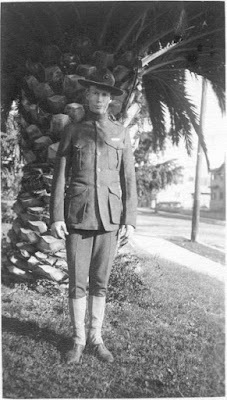 I don't know the setting of this photograph - it may be near the Carringer house on 30th Street in San Diego with a typical palm tree as a background. Lyle enlisted in the United States Marine Reserves in 1917, and served in the P X at the Marine Encampment in Balboa Park through 1918. He was all of 5 feet 7 inches tall and about 125 pounds, but he was a Marine! Lyle married Emily Auble on 19 June 1918 in San Diego. "During both the Great War and World War II, the park was handed over to the Department of the Navy to be used as a barracks and training ground and was an extension of Naval Medical Center San Diego. By 1917, after $30,000 in repairs and modifications were made to the original buildings, over 5,000 U.S. troops were using the park for training. "Coinciding with the Panama–California Exposition, the Commandant of the Marine Corps instructed 2nd Battalion of the newly established 4th Marines to represent the Marine Corps at the event. On December 19, 1914, Marine Barracks, Balboa Park, was established as the second, and during its period, and only Marine base in San Diego. It remained in place until 1921, when a more permanent base was established in Dutch Flats, itself a predecessor of Marine Corps Recruit Depot, San Diego." I never saw my grandfather wear his Marine uniform, and I don't know what happened to it. I'm sure that he would have fit in it all of his life. He was the most peaceful man that I've ever known.